You can’t read a business article or go on social media without being bombarded with information about #DigitalTransformation. But what does it actually mean? Our take on it – Using technology to solve age old problems , enhance processes and increase productivity. Digital Transformation is only for big organisations who’ve got the time, money and resources to invest in modernising and digitising their operations. Right? 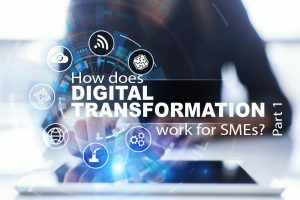 The use of technology – as part of a digital transformation journey – enables SMEs to challenge the bigger players, disrupt traditional markets and compete on a level playing field with the latest tools for business efficiency. In uncertain times, standing still is not an option! And the good news is that although Digital Transformation may sound like an all encompassing task, you can start small. Think carefully, do your research, be really clear about what you are trying to achieve. What processes or areas of your business need to change and improve, and how will any changes impact on the rest of the business? Even if you decide to change things in stages, you still need to keep an eye on the bigger picture and consider how you want everything to integrate and work together in the future. Get some good advice from a business that specialises in process improvement. You don’t want to spend a lot of time and money to digitising and automating what was a bad process in the first place. Your transformation should be what is right for your business. There is no standard answer, no one size fits all scenario. Digitising and automating the right processes can help you to make big savings in time and money. More of both can be used to further grow and develop your business. Like many of you, we fit the SME profile, but the move towards digital has helped us to hire the right staff, based on their skills rather than location. Some of our favourite tech that helps us to securely share documents, tasks and project details, and keep the whole team in the loop include our Invu Document Management system, Microsoft Azure cloud, Skype, Slack, and the Teamwork Projects App. Our experience has found that areas that create and manage vast amounts of paperwork, such as admin, accounts and HR, are ripe for transformation, and yet they are often overlooked in favour of more important, exciting or customer facing departments. We look at some common business problems and how digital transformation can help to solve them. Few businesses really understand how much time and money is spent managing paperwork. Paper, ink, filing cabinets, off site storage – the costs can quickly add up. Undertaking a comprehensive document review will highlight how documents are used in your business. Some of the questions you need to ask include what kind of documents do you handle? What kind of data do they contain? How is the data processed? How are your documents stored? How long does it take employees to find the information they are looking for? How easy is it for employees to share documents with colleagues? With the onset of GDPR, the answers to these questions have become even more important. SOLUTION: A Document Management system. We’ve heard about the ‘paperless office’, well for many businesses this is now a reality. With a Document Management system you can streamline the management and flow of documents throughout your organisation to improve efficiency and performance, save you money and remove inaccurately filed documents. Forms, applications, paper documents and schedules are stored, securely and compliantly, with indexes, to create searchable content. GDPR has made the ability to access historical information crucial for a subject request, a good Document Management system will allow you to find data in seconds. We’ve just scratched the surface of digital transformation in this post. In part 2 we take look at some specific areas including Invoice Processing, Expenses and Analytics and see how embracing technology can transform your business.